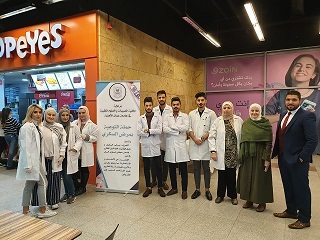 The AAU Faculty of Pharmacy & Medical Sciences organized an awareness campaign on Diabetes at the Faculty of Pharmacy and Faculty of Engineering on Thursday, 13/12/2018 and at Mecca Mall on Saturday, 15/12/2018. The campaign included a free blood sugar test and advice provided by students on how to maintain the normal level of blood sugar and how to use the Diabetes medicines. The campaign was marked by the large turnout among the members of the community that reaches 300 people. All expressed their satisfaction with the campaign and wished to establish more health awareness campaigns of this kind.